I've been asked to do a "How to Quilt with Rulers on Your Long-Arm" class so it's all set and ready to go. I posted a little 4 questions survey on FaceBook and asked folks to do the survey if they were interested in the class. The class content will be based on survey responses. This post summarizes what we'll be talking about and doing in class. Why use rulers/templates with your long-arm? The quilt I'm working on right now - using two rulers - my trusty straight edge (most used ruler) and a Mysti'Curve ruler. How to use a ruler - general technique - discussion first then I'll demo. It's not magic, but it does take lots of practice!!!! Here are some pix and chat about a few of my recent projects where I did a lot of ruler work. 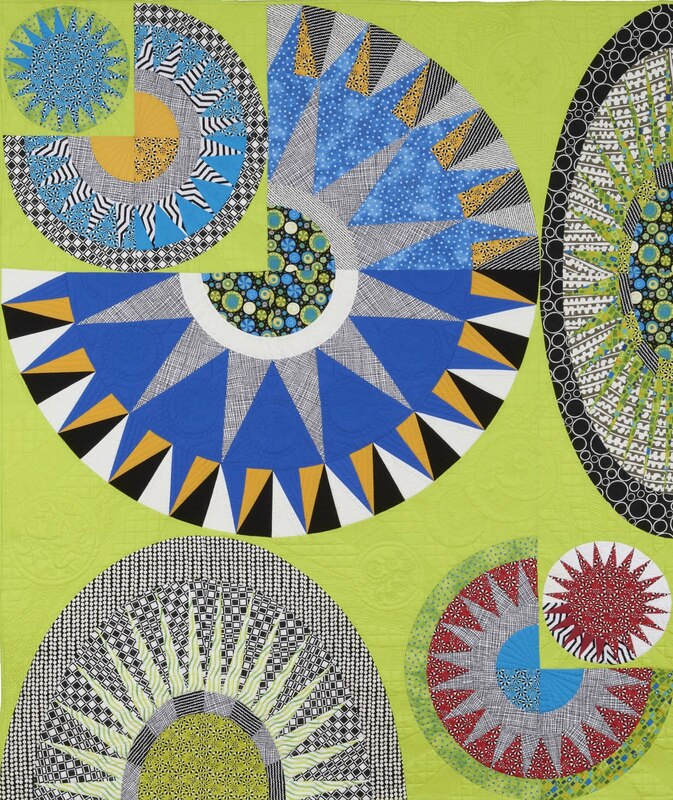 At the time of writing I'm working on this Sew Kind of Wonderful "Metro Hoops" quilt. This is a customer quilt. She liked some design elements as the designer had quilted it. We talked about a couple of other design elements that I didn't think worked so well and she agreed. So this is what I came up with. The only bits of this quilt NOT being quilted with rulers are the feathers and the matchstick quilting around the corner block stars. Note the curve cross-hatch - someone responding to the questionnaire asked about that - I'll show you how to do it in the class. This is my Key Lime Galaxy quilt. I've blogged about this previously so these pix are repeats. I did a lot of ruler work in this quilt. I have a set of circle templates that range in size from 2 to 12 inches so I do a lot of things with circles and arcs. The grid work and straight lines are done with my straight edge. More fodder for the class. I did some ruler work on this little quilt. 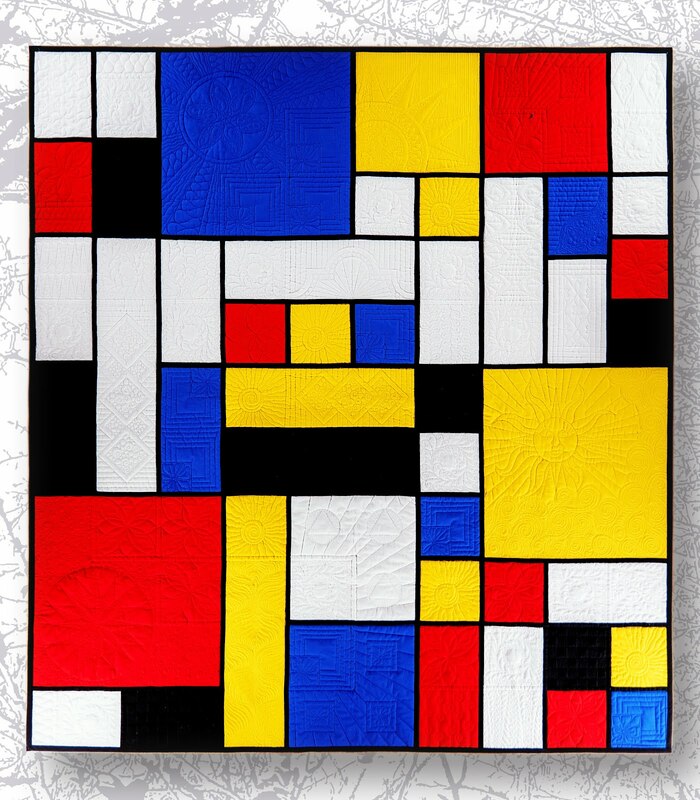 So how the heck do you decide how to quilt such a quilt? We'll talk about how to decide on a quilting design. Cross hatch and a motif. Sometimes I like to experiment so I decided to put in what I would call cathedral window shapes. How do you do those???? I can show you. Recently I've done a couple of T-shirt quilts - also in a previous post I believe. Border design - I really like this one - it reminds me of wrought iron, which is a favourite of mine. Note the end and side borders are different widths so the corners would have been a bit complicated - so I did the sides and the ends separately. On the wider borders, I thought doing one swath of the triangles would not have been enough coverage so I did two stacked rows. 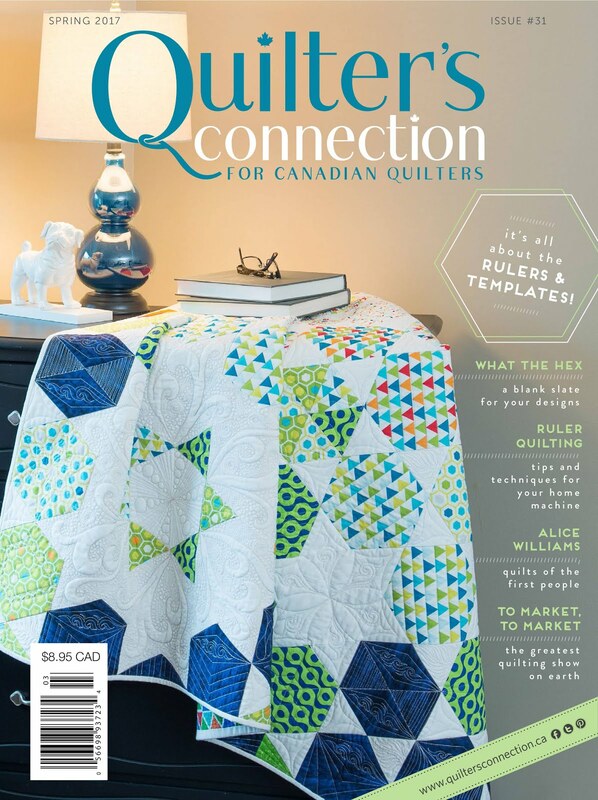 The result is a nice design and more coverage in terms of quilting, which fulfills the functional aspect of quilting - holding that sandwich together! Sometimes it's easy- straight lines to outline the pix - this is actually a very effective treatment for this particular block (in my humble opinion!) . Sometimes I get inspired: "Edge" > "Edgy" > jagged saw-tooth edge. Such is my thought process. So how's it all done? Often by measuring and marking. Above - the border is all marked out and stitching has begun. I wanted to outline the logo, which is round. Do I have a circle or arc that fits this circle size? Of course not! But with the many sizes I have, I just chose the closest one and bullied it into place. Since these quilts are for a young man, I didn't want to do too much "girly" stuff. I figured I could get away with the curls in the borders because it also has strong straight lines, but in the sashing, where I might have done something a little "fancier", I opted for a one inch grid, which I think worked out very well. Did I mark it? Heck no! Too much marking and my little ruler has 1/4" lines marked on it so use those as a guide. Above - the horizontal line being stitched in - below, the vertical lines. The 1/4 " marks on my ruler show up on the red in the below pix. I guess we're a bit out of order here - but these pix show the border marking process. I start in the centre and work out so the design is balanced. Below, the horizontal lines - don't forget to mark them in from the edge of the border. I find if I don't have a line, I will forget to stop at the right spot - need to leave room for the binding! Below - it's not all that often that a border (or anything else for that matter) will work out perfectly. This is where you find out how accurate your piecing is! As you can see the last increment didn't quite work out. I'm not going to take extra time to work it all out exactly - instead, take the last two increments and divide them into two equal parts. Believe me, no one will notice!!!! This is the second of the T-shirt quilts. My customer had a special request on this one. She wanted three crowns - one in each of three blocks she specified to me. So I did those and then decided to put the same crowns into the top and bottom borders. And then I went a bit crazy and scattered some stars in a few blocks and in a couple of corners. This is something I experimented with on my Hunter Star quilt (another post). So what do stars and crowns have to do with rulers? I don't have such rulers. But I do use rulers wherever there is a straight line and I use a little short ruler to steady my hand as I go around the non-straight parts of the design. To get a good outline, I cut templates out of card stock (junk mail, actually!) and trace the design onto the fabric, then stitch the design into the quilt. I've done this many, many times before for different design elements - dragonflies, butterflies, hearts, frond shapes.... it would be great to have an actual ruler for all of these shapes, but even if you could find them it would cost a fortune to get them all!!! So this is my Plan B. 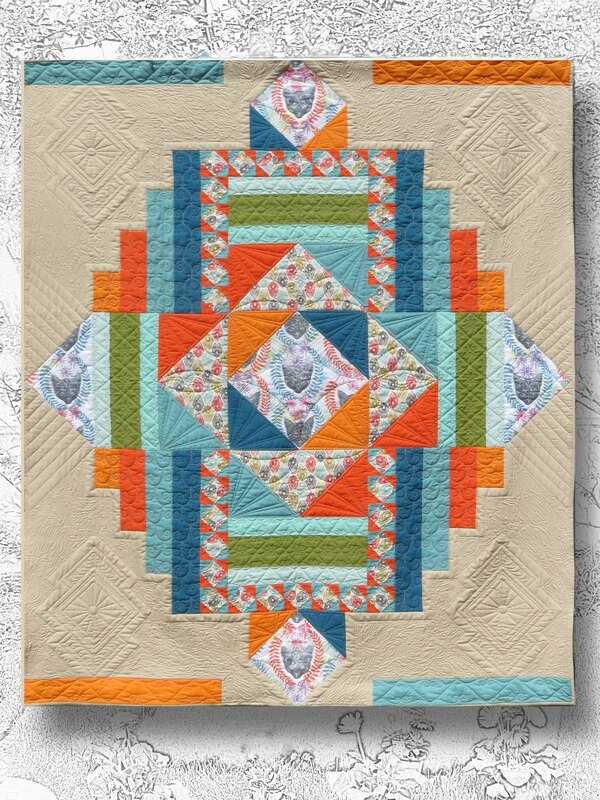 About the borders and sashing in this quilt: loops and ribbon candy - I don't think these designs are too "girly" - do you? In the Play On block below, I used a little hex ruler I have - these are like puzzle pieces, the hopping foot fits INSIDE the shape with the ruler actually fit around the outside - otherwise it would be a real challenge to get such small shapes using a conventional ruler. I'll bring these rulers to the class to demo. Another trick is to use different thread colours. I wanted the crowns and stars to show so I did them in gold. But the rest of the border quilting is essentially just to hold the sandwich together so it didn't have to show - I did that in navy so it recedes into the the border fabric and doesn't show in normal lighting. Finally, this is a quilt that I just finished. It's a very simple pattern that I found on the Midnight Quilter YouTube series produced by Craftsy. Angela Walters demos it but more to the point, she also provided the quilting design, so it was absolutely a no-brainer. 😎 And as I'm doing this ruler class, I did the quilting entirely with rulers. Again, my straight edge and a Mysti'Curve (I have four sizes and this one is the smallest). I hope this gives you a sense of some of the ideas we'll talk about, I'll demo, and you can try out, in the "Quilting with Rulers on Your Long-Arm" class. See you there!